The young generation is growing up demanding that their food be not just ‘good’, but good for them. Gone are the days of food coloring and ingredients we cannot read. People simply care more about what they are putting in their bodies. And the food industry is listening. Companies over 100 years old are revising their marketing and revamping their recipes to cater to a newer healthier audience. As they renovate, they seek new technologies and innovations to do so. World resources are shrinking as the human population explodes. For decades, the food industry worked to fill the booming demands using low-cost solutions and compromising on the quality of ingredients and resources. The answer to all of these challenges is foodtech. Foodtech adds human innovation to the best of nature, improving it and bringing the results to the global market. 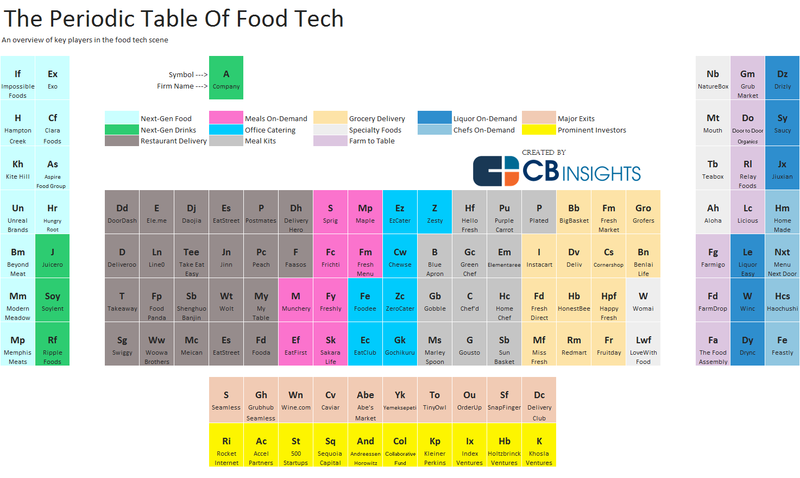 Excerpt: To illustrate the diversity of categories within food tech and call attention to some of its most prominent players, we created the Periodic Table of Food Tech. The table focuses on active food tech startups that have raised funding since 1/1/2013. While it can’t encapsulate every startup in the space, it highlights many of the most well-funded and high-momentum companies within each category. The table also shows most notable food tech exits and most active food tech investors. The 119 companies and investors on the table were pulled from analysis using CB Insights data around funding, company momentum as captured by our predictive Mosaic algorithm tracking the health of private companies, and recent deals in the space.